Various herbs and other ingredients can be added to salted or unsalted butter to produce different colours and flavours. They are sometimes referred to as compound butters or beurres composés. (Larrouse) I love making flavoured butters and as they keep in the fridge, you can make once for a few meals. 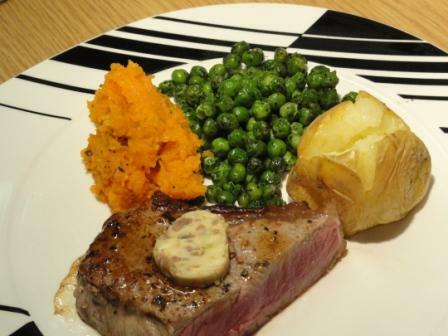 You can use the butter cold on top of steak or fish or even vegetables, and you can add your flavoured butter to sauces. I have chosen to make anchovy butter as I love the saltiness these little morsels impart to a dish. Anchovies are found so much in Italian cuisine…I love them! My anchovie butter includes chopped up capers..I love anchovie butter, also great with fish! I love this – I will definitely try this!! I totally forgot about this idea of yours and was reminded now again after your yummy fish dish! Yummy! I’ve not made anchovy butter – only made garlic, parsley and other herbs butter before. Pete and I would eat too much of it I reckon, both being lovers of butter and anchovies.